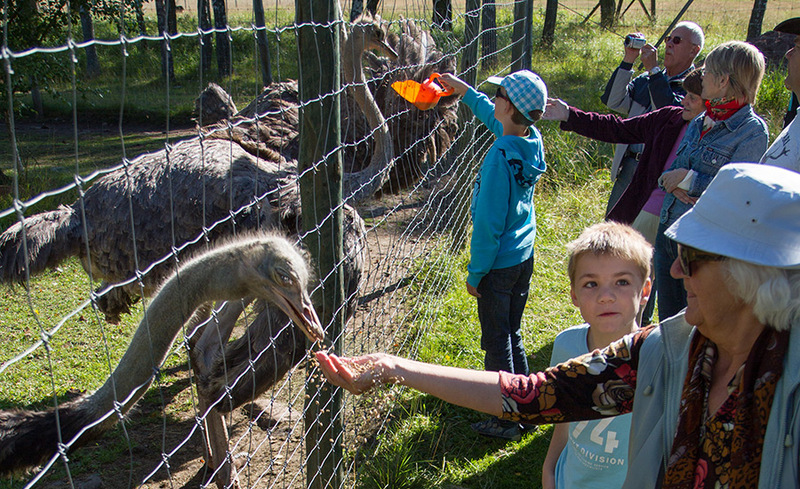 View the animals up close! Ride in our safari trolley, which takes about 40 persons, on an unforgettable guided round trip in the game pasture where you can see red deer, fallow deer, wild boar, ostriches and lamas. During our round trip we stop to see the animals and you get a possibility to see them at really close distance. The safari takes about 45 minutes and starts nearby the Hunting & Fishing Museum in Käringsund, Eckerö. 17.6 – 30-6: 12.00, 13.00, 14.00, 15.00 daily. Midsummer evening 21.6 closed. In the safari shop you can buy our popular meat products; game sausages, smoked deer and wildboar meat, ostrich eggs. You can also buy for example coffee, ice cream and souvenirs. For groups, we accept bookings throughout the year. 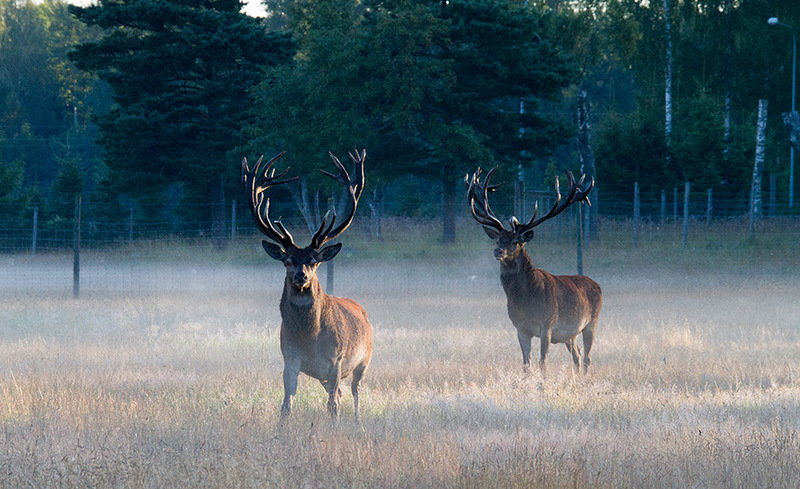 Red deer is the world’s third largest cervid animals. The male is 175 to 225 cm long from nose to tail, tail length is approximately 15 cm. The height is between 130 and 160 cm and a normal deer weighs about 200 kg. The female (doe) is considerably less, the body weight is about half of the male’s weight. 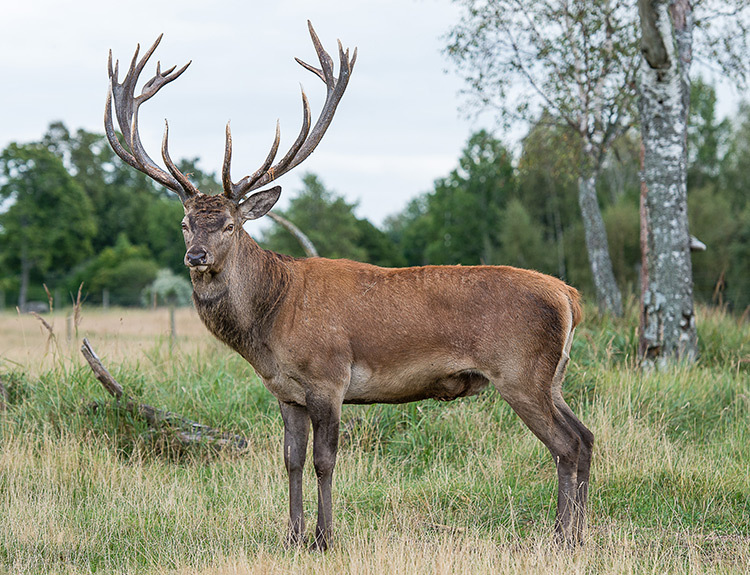 Red deer feed on grass, herbs, leaves, twigs, buds, mushrooms, beech and acorns and bark especially spruce and beech. Fallow deer is a deer which is less than the stag.The fallow deer originally from the Mediterranean region, but is widespread through central Europe. 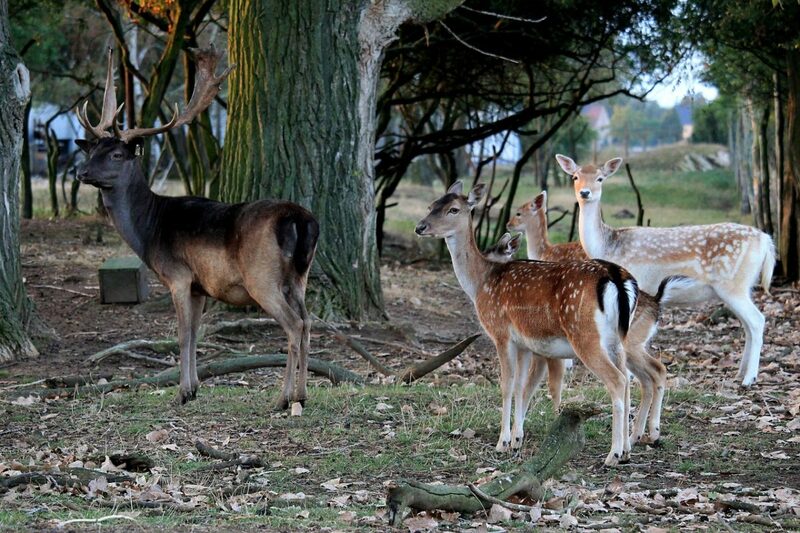 Males weigh about 100-120 kg, while females (hinds) 60-80 kg. Fallow deer normally eat grass and leaves. Wild boar is a biungulate animal of the same species as domestic swine. The species’ original range stretched from Western Europe to Southeast Asia, but are now almost all over the world. A sexually mature male is called boar and is between 150 and 180 cm long and 70 to 100 cm high. 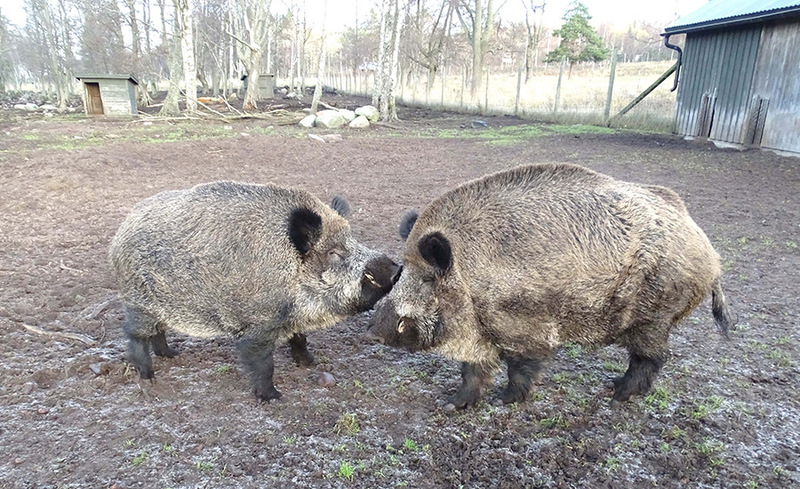 Boar weighing up to 225 kg, while the sow weighing between 70-140 kg. Wild boar have pretty bad eyesight (though not as bad as rumor has it) but a good hearing and an extremely good sense of smell. The pigs can smell a man of nearly one kilometer away if the wind is right. Wild boar can be about 30 years. Wild boar are omnivorous, but 90% of their diet consists of plant foods. Ostrich is a very large, long-legged and long-necked bird species present in Africa. The ostrich is the largest living bird and also adds the largest eggs. They can not fly but can run at speeds up to 65 km / h. The diet consists mainly of various parts of plants, but also insects, worms and grubs. The Lama (Lama glama) is a domesticated South American camelid, widely used as a meat and pack animal by Andean cultures since pre-Hispanic times. The wool produced by a llama is very soft and lanolin-free. Lamas are intelligent and can learn simple tasks after a few repetitions. They are extremely curious and most will approach people easily. 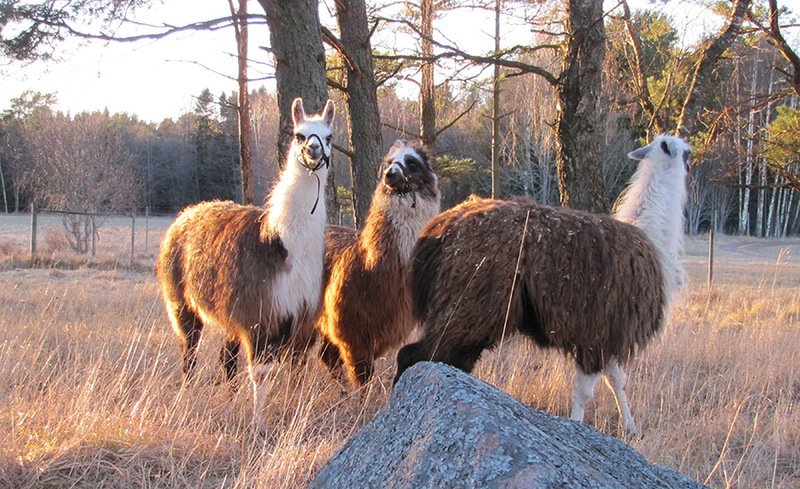 When correctly reared, llamas spitting at a human is a rare thing. Llamas are very social herd animals, however, and do sometimes spit at each other as a way of disciplining lower-ranked llamas in the herd. Tro det eller ej... Men idag är det säsongens sista dag. Asterix och Idefix trodde inte på mig när jag sa de till dem. Snart stänger vi för säsongen, med bara två dagar kvar, passa på att åka em sista gång i år ännu ! Kl 12 13 och 14 går turerna på fredag och lördag.